A.R.I. 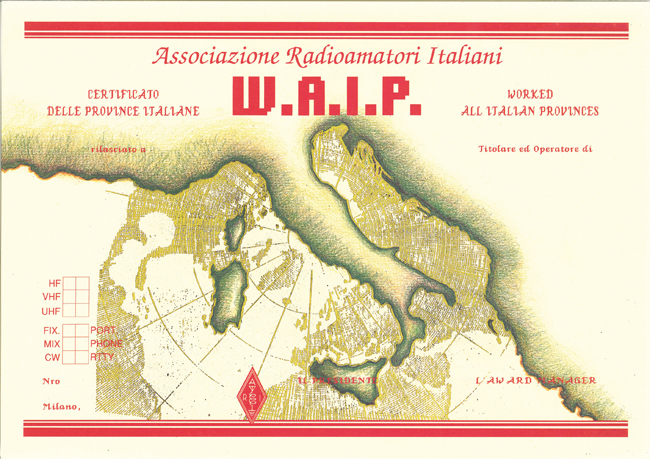 - Associazione Radioamatori Italiani is proud to present the WAIP Award (Worked All Italian Provinces) for HF bands, for Radio Amateurs of all the world. A.R.I. 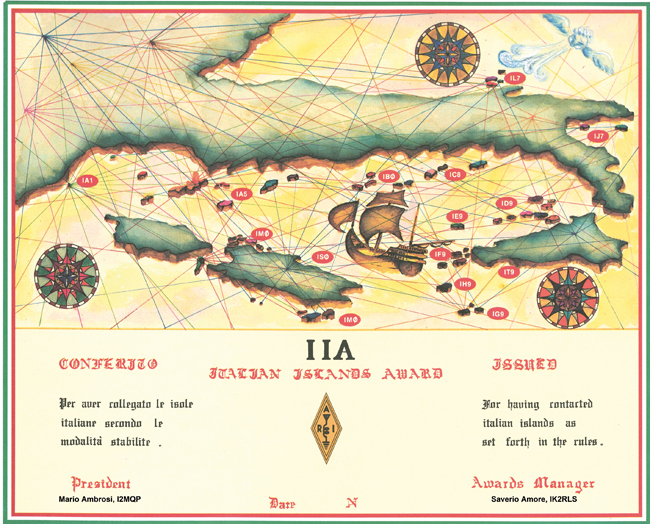 Associazione Radioamatori Italiani, issues the Italian Island Award (I.I.A.) to licensed amateur radio operators and SWLs for contacts made with stations located on islands belonging to the Italian Republic. Cross-band and/or cross-mode QSOs are not acceptable. Minimum level is 1000 DXCC entities, using all HF bands from 10 to 160 m, including WARC bands. Available upgrades each 100 confirmed entities until 2000 entities. Only current DXCC entities are valid, no deleted entities. The list just have to report the total number of the entities confirmed in each band, without the list of the contacts. Since March 1st, 2008 all QSOs present in the LoTW database and those confirmed through an electronic way are valid. For other QSOs, the applicants must declare that the related QSL cards are in their possession, and the Award manager can request some of them for checks anytime. The fee is 10 Euro or 13 US $ or 13 IRCs. 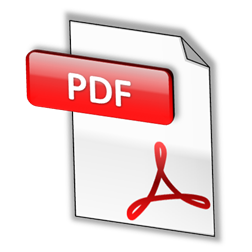 Free PDF file is also available instead of paper award. Stickers for upgrades from 1100 to 2000 points are available and can be requested to the manager. 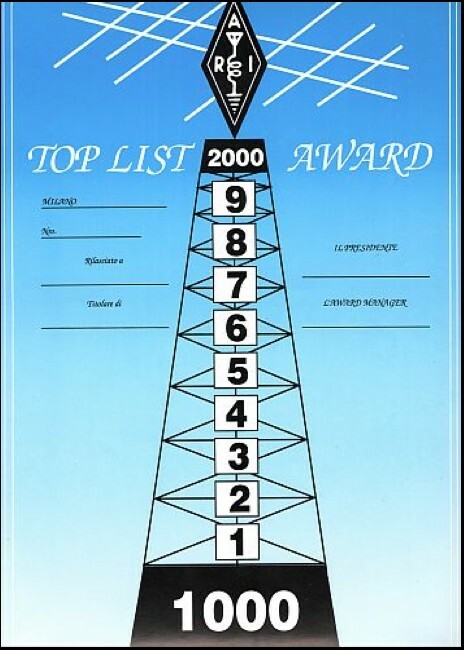 First classification, TOPBAND replies the Toplist Award: it is the sum of the entities confirmed in each band. E7 – Bosnia & Herz. The Award has different endorsements for CW, Phone, Mixed and Digimodes. Please send the applications to the Manager: Luciano Lucini IK2QPO, Via Botticelli 30, I-20133 Milano, with 5€, or 8 IRC or 8 US$. Applications must contain all QSO data, sorted by Entity. The sending of the QSL cards is not required but they must be in possession of the applicant and the Manager can request some of them for checks anytime. N.B for QSO before 1991 the entità Yugoslavia replaces: Slovenia, Croatia, Bosnia and Herzegovin; for QSO before 2006 Yugoslavia replaces Montenegro.